This weekend, my 8-year-old son and I made these cupcakes together. The interesting ingredients resulted in probably the best cupcakes we’ve made. Yum! Line 2 cupcake pans with liners and set aside. Add cake mix, eggs, vegetable oil, Pepsi, maraschino cherry juice, cinnamon, cardamom and vanilla extract to a large mixing bowl. Beat on low for 30 seconds then beat on med-high for 2-3 minutes. Pour 1/3 of cake batter to a small mixing bowl. Add the cocoa powder and mix well with a rubber spatula. Divide the non-chocolate cake batter evenly between the 24 cupcake liners. Divide and dollop the chocolate batter evenly between the 24 cupcake liners. Using the dull end of a wooden skewer, marble the batter. Cool completely then frost with your favorite buttercream frosting and top with a maraschino cherry. Garlic… You either live it or you hate it….. This recipe uses an entire bulb of garlic! While it slow cooks, the garlic gets soft and mushy. The flavor mellows…resulting in an almost sweet flavor. Separate cloves of garlic. Peel & smash with the back of your knife. Set aside. In a large bowl, stir together wine, broth, thyme, salt, pepper and hot paprika. Set aside. Pour broth/wine mixture over chicken. Add olives and garlic. Top with sliced lemons and shallots. Season top of lemons and shallots with salt and pepper to taste. Serve with rice or buttered noodles. Last week, I taught my first cooking class at the Savory Spice Shop in Raleigh, NC. The theme for the class was Caribbean cooking. We had a lot of fun cooking, talking and sharing information, stories….and laughs. Below is the recipe for Black Bean & Mango Salad. I love this salad recipe because it is easy to make and perfect for spring/summer parties. The flavors are simple, fresh and versatile. It pairs well with chicken or seafood. Below is the recipe for Banana Salsa. I chose to present this recipe because it is simple, flavorful and colorful. If you like mango or pineapple salsa, you will love it. Also, bananas are SO much easier to chop than both mangos & pineapple. Try serving it with blue corn tortilla chips or serve alongside of either chicken or fish. It was a big hit at the class too. Enjoy! On the weekends, my husband and I like to take time to watch a movie together. This past weekend I made a dessert cocktail for our “movie time”. 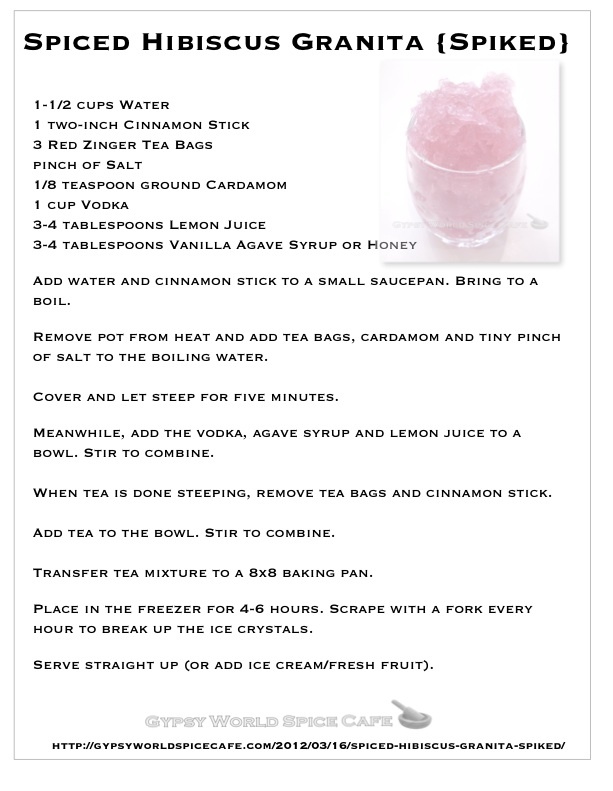 Granita is easy to make and the variations are only limited by your imagination. Be sure to check out some suggested flavor combinations at the end of the recipe. Add water and cinnamon stick to a small saucepan. Bring to a boil. Remove pot from heat and add tea bags, cardamom and tiny pinch of salt to the boiling water. Cover and let steep for five minutes. Meanwhile, add the vodka, agave syrup and lemon juice to a bowl. Stir to combine. When tea is done steeping, remove tea bags and cinnamon stick. Add tea to the bowl. Stir to combine. Transfer tea mixture to a 8×8 baking pan. Place in the freezer for 4-6 hours. Scrape with a fork every hour to break up the ice crystals. Serve straight up (or add ice cream/fresh fruit). 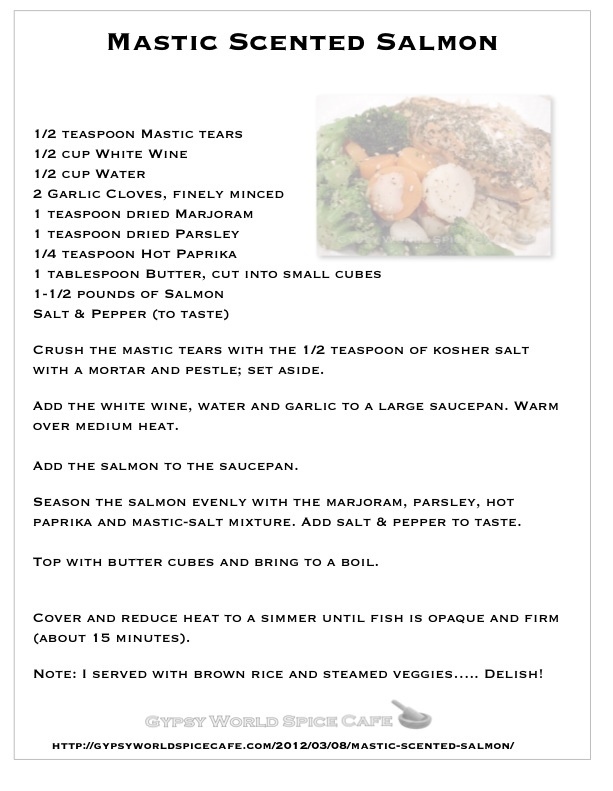 Click the Image to Print “Just The Recipe”!